Shuttle UM's main hub in the University of Maryland, College Park is outside of the Adele H. Stamp Student Union. 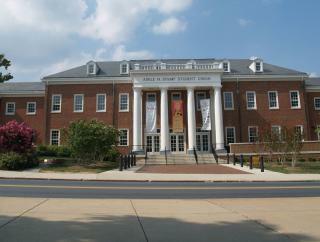 Adele Student Union is a community center where all University of Maryland (UMD) students gather for social activities. The center is home to a number of UMD clubs and organizations, restaurants and bookstores, and recreational areas. Located outside Adele H. Stamp Student Union is the bus stop for all Shuttle UM routes. Shuttle UM provides UMD students and College Park residents with free transportation to many locations including but not limited to Gaithersburg, Silver Spring, and Hyattsville, MD. College Park residents can obtain complimentary Shuttle UM bus passes from City Hall, Davis Hall, and Youth and Family Services. Such a transit system enables people to use public transport, thereby reducing the environmental impact of car pollution. Also, Adele H. Stamp Student Union is an excellent place for gatherings which promotes social interaction.